How is the Qur'an - central to all Muslim societies - to be understood today in order to meet the needs of these societies? Abdullah Saeed, a distinguished Muslim scholar, explores the interpretation of the ethico-legal content of the Qur'an, whilst taking into consideration the changing nature of the modern world. Saeed explores the current debates surrounding the interpretation of the Qur'an, and their impact on contemporary understanding of this sacred text. Discussing the text's relevance to modern issues without compromising the overall framework of the Qur'an and its core beliefs and practices, he proposes a fresh approach, which takes into account the historical and contemporary contexts of interpretation. 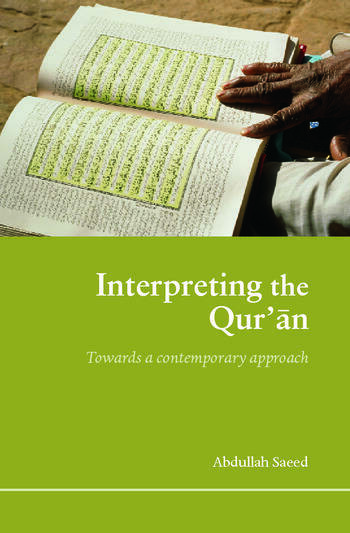 Inspiring healthy debate, this book is essential reading for students and scholars seeking a contemporary approach to the interpretation of the Qur'anic text.